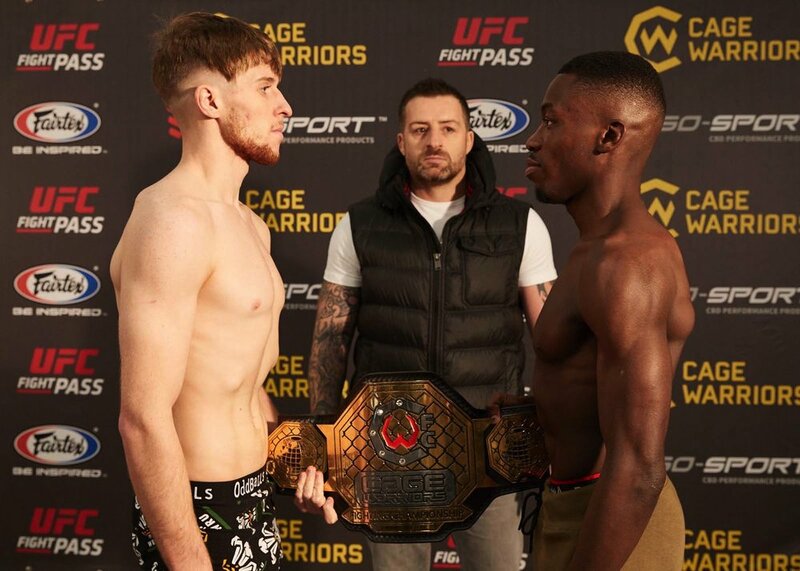 Fighters from across Europe descended on Cardiff to weigh-in for Cage Warriors’ biggest event of all time, with just one day to go before doors open at the Viola Arena. The atmosphere was electric in Cardiff this afternoon as UFC legend and former Cage Warriors champion Dan Hardy called the ISO-Sport weigh-ins for CW100. Fighters stepping up for the mammoth centenary event faced off with their opponents for the final time before meeting in the center of the cage. In the main event, Welshman Jack Shore will take on London’s Mike Ekundayo in an elite level bantamweight title fight between two unbeaten prospects. Shore’s campaign for the title was cut short in September with two opponents pulling out at late notice – but this one’s official. Shore tipped the scales at 134.9 lbs, with Ekundayo coming in at 134.7 lbs. In the co-main, Dean Truman and Aiden Lee fight for the featherweight title previously held by names such as Conor McGregor and Paddy Pimblett. Both men made championship weight successfully, with Truman making 144 lbs and Lee 145 lbs. With this title launching the careers of some of the biggest names in the sport, it’s all to fight for tomorrow night. 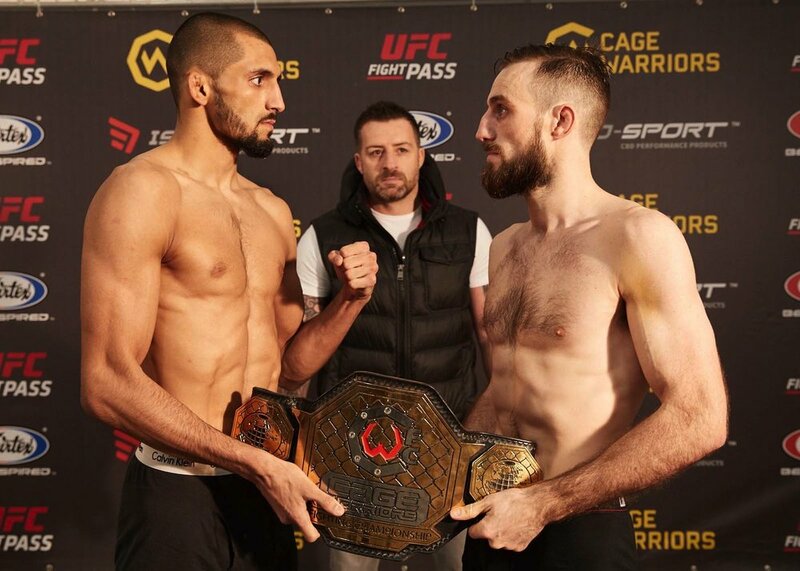 Two big welterweight fights take place earlier in the night, when Håkon Foss (169.2 lbs) takes on Aaron Khalid (170.6 lbs) and UFC vet Nicolas Dalby (170.8 lbs) comes up against Phil Mulpeter (170.4 lbs). Opening up the main card are Commonwealth Judo Champion Scott Malone (134.8 lbs) and former bantamweight title challenger Josh Reed (134.8 lbs), who will have the Welsh crowd behind him. Limited CW100 tickets are still available HERE. Doors at the Viola Arena open at 3PM. As well as a non-stop night of fight action, fans have the opportunity to meet UFC legend Dan Hardy, former CW champs and now Welsh UFC names Brett Johns and Jack Marshman, and CW Octagon Girl Edith Labelle at the CW100 meet and greet. And that’s not all. Before the CW100 pro card, the Cage Warriors Academy Grand Prix finals will see Europe’s top amateur talent compete for a pro contract, after fighting their way through the quarter and semi finals throughout 2018. The CW100 Main Card (from 9PM) will be broadcast live on BT Sport 3 and UFC FightPass, as well as a host of premium global partners (see here for details). Pro Prelims (from 6.45PM) will be shown LIVE and FREE worldwide on the Cage Warriors Facebook page, and for UFC Fight Pass subscribers. See below for the weigh-in results from every fight on the huge CW100 pro card – the biggest the promotion have ever put together.